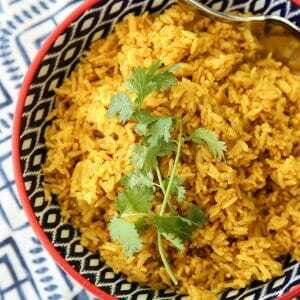 An easy, savory rice recipe infused with healthy turmeric. Pairs beautifully with grilled chicken, lamb, and beef. This recipe is for just 1 cup of rice, feel free to double for a larger batch. Heat medium-sized pot with lid on stove top. Add oil and onion and cook until onion is tender, about 3 minutes. Add turmeric and curry powder and stir to heat and distribute for 15-30 seconds. Add broth and bring to a boil, add rice. Reduce heat to a simmer. Cover pot and cook for 20 minutes, covered the entire time. Remove from heat, fluff with a fork and add salt to taste before serving.